A common argument against veganism states that as humans have canines, we have evolved to be omnivores and therefore must eat meat – but this perspective is flawed. Omnivores are animals which eat both plants and animal products such as meat, eggs, fruit and vegetables. This description fits most humans today, but the existence of canines alone does not mean a species always eats other animal products. Hippos, for instance, have the largest canines of any land animal and are total herbivores. 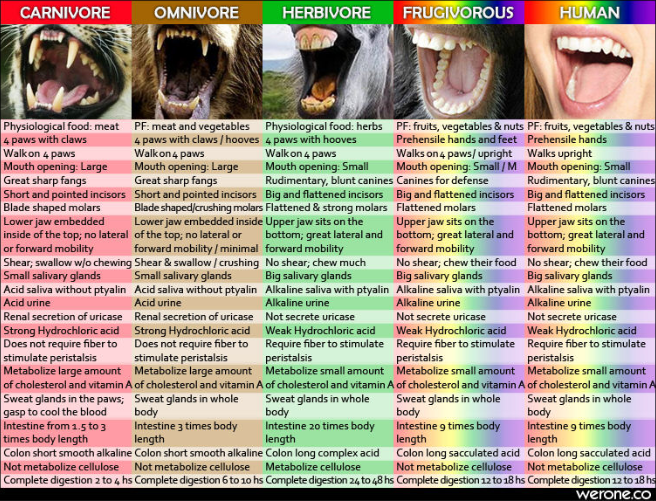 Humans actually have far more obvious similarities to herbivores, in comparison to purely meat-eating carnivores. 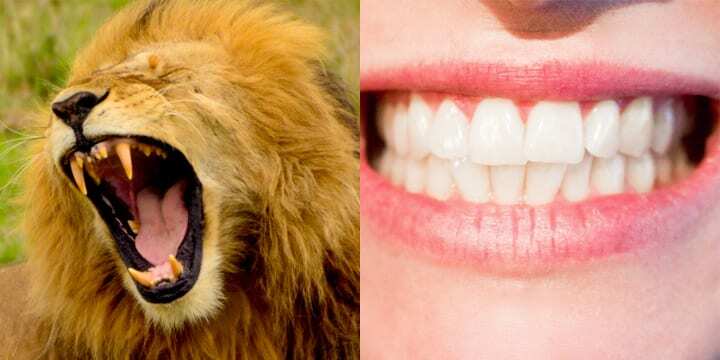 Similarly to herbivores we have blunt teeth and fingernails which are not capable of tearing flesh, and our jaws move from side-to-side to help us grind fruit and vegetables. Carnivores have large, sharp teeth and their jaw only moves up and down to assist tearing through flesh. In addition our stomach acids are weaker than carnivores, who have very strong acid needed to digest meat. While humans have eaten meat for much of our history, evolution is continuous and there is nothing stopping any species from adapting. A species being capable of an action does not mean it must and will do it forever. Evidence suggests humans started drinking milk as recently as 7,000 years ago as we evolved into an intelligent species capable of manipulating food sources. While at the time it this may have been vital in providing proteins and fats to humans which they could have struggled to find elsewhere, that simply isn’t the case today. We have since evolved into a species capable of manufacturing and distributing huge amounts of any food we desire, and we are capable of monitoring our diets to ensure we consume the right amount of nutrients to thrive. Therefore, the need for us to eat animal products to survive simply does not apply to most modern societies, and scientists have suggested we move towards a plant-based diet for the sake of our health and the health of the planet. If there is no physical need to eat meat today, the canine argument relies on the fact that we are capable of doing so, rather than its necessity. But if we use capability as a justification for doing something, we enter an extremely confusing ethical framework. Across the world women have been suppressed by men who have been capable of exploiting and controlling them, but this does not make it right to so. A schoolboy who is bigger and stronger than his classmates is capable of bullying them and stealing their lunch money, but this does not justify him doing so. Defending meat eating in biological terms alone contains endless contradictions. But even if we were to cherry-pick scientific evidence and conclude that humans are designed to be meat eaters, this would not mean it is the right thing to do.